UBP’s Free Bike Program provides refurbished, utilitarian bicycles to youth and adults in Wilmington and surrounding areas. The program also provides bike locks, helmets, lights, and fenders, when available. UBP offers drop-in Youth Shop hours every Wednesday evening. 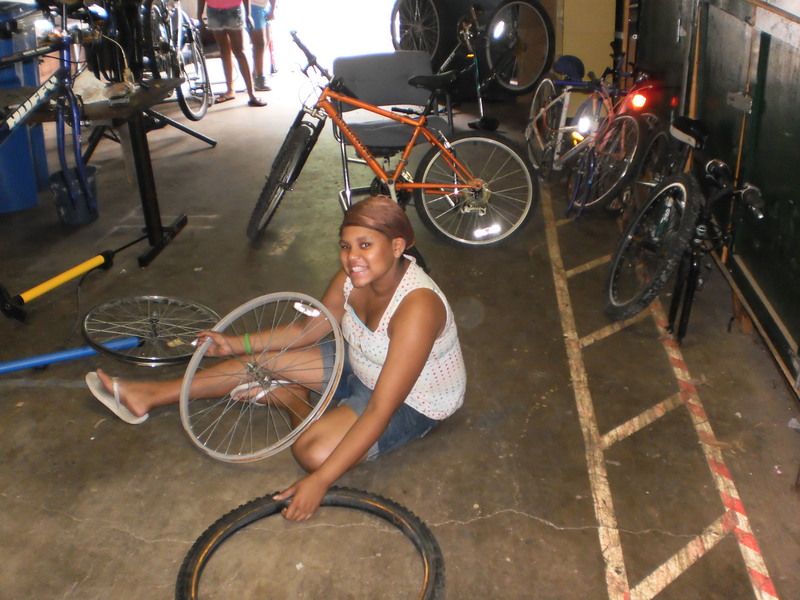 Neighborhood youth visit youth shop to repair their bikes, learn mechanics, volunteer to earn shop credit, and participate in weekend bike rides and field trips. UBP partners with area schools and youth organizations to give students the opportunity to earn a free bike while learning mechanics, bicycle safety and important STEM concepts. Changing a tire at the Fraim Boys & Girls Club Build-a-Bike sponsored by the Mike Clark Foundation. UBP Youth EAB education at work!